My Lords, for more than a hundred years the people of Yeovil and South Somerset have provided the nation and the nation’s allies with world-beating aircraft which have played an immense part in the defence of our shores and of our values. Yeovil-built aircraft were amongst the first to fly in battle over the Western front and provide air support for the Royal Navy. Westland Lysanders flew our secret agents into every corner of occupied Europe in WWII. Westland helicopters dropped me on Jebel tops in Arabia, plucked me out of clearings in the Borneo jungle and gave us the mobility we needed in Northern Ireland. They did the same in Afghanistan, Iraq and every other conflict zone. This is not just the past, My Lords. It is also the future. As we rely more on special forces, they will rely more on helicopters for long range insertion. As the Royal Marines end assaults on defended beaches, helicopters will be the only means to land men in numbers where they enemy does not expect them. As the Russian submarine threat grows, rotary wing will arm our ships with the best means of detection and response. But this debate is not just about our armed forces needs. It is also about an irreplaceable national aero-space asset. The rotary wing skills found in Yeovil, are found nowhere else in Britain. So, Yeovil must surely feel pretty confident about what comes next? Our brilliant design and engineering teams must surely feel secure about their future? No, My Lords, they do not. They are beginning to leave in numbers. And there is a reason for that. 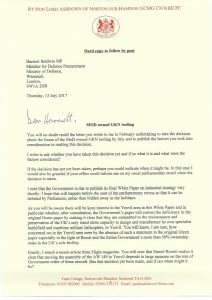 Despite many requests from me and, I am assured, from Yeovil’s MP, Marcus Fysh, the Government has made no clear commitment, as part of the National Industrial Strategy, that they wish to sustain this unique sovereign ability to design, engineer and manufacture our own rotary aircraft. This doubt about the Government’s intentions began when the MoD abandoned the policy of the Coalition Government which insisted that an MOD order for Apache aircraft must be subject to a proper competitive tendering process – replacing this with a decision to buy off the shelf without competitive tender, from the US. Since then, every procurement action of the Government has re-enforced the suspicion that the MOD prefers to buy new aircraft from abroad than make them ourselves, even if the consequence is that a vital national asset is lost and the Yeovil site degenerates into a repair and maintenance facility only. Over the years, Yeovil-built aircraft have been sold to over 20 countries. We are one of the nation’s major exporters. But what export customers now say, is if the British Government will not buy helicopters made in Britain, why should they? I cannot believe that the Government wishes to preside over the disappearance of a key national capability and prefers to make our armed forces dependant on foreign skills when we have such an abundance of our own. Post-Brexit, they cannot wish to destroy export opportunities. Yet that is where we are heading. If this is not what the Government wants, then it is time to make that clear – urgently. I appeal to the Government to make this statement without delay. Today for preference. In the Modernising Defence paper, due by the end of the month, if they must. In the Budget as a last resort. I have to warn that if this, or something along these lines does not come by the end of the year then the crucial decisions Leonardo needs to make, may not be made, the erosion of Yeovil’s skill base will accelerate and a national strategic industrial asset will be in grave jeopardy. In his answer the Minister may stress the Government’s Strategic Partnership Agreements – so called SPAs – and maybe even announce a new one. SPAs are useful and they are welcome. But they are not the answer. In their present form SPAs have no impact on the procurement process. That is where we need the action. As part of the Government’s policy to maintain a national capability in the design and production of warships and combat jets, it requires front line commanders to consider indigenous industrial capability in making procurement decisions. This is what is needed and what has been so significantly absent in relation to rotary wing. My Lords, led me, in summing up, lay out what is at risk here. It is always looks cheaper to buy off the shelf. But in this case that would be, in the long term, far more expensive as we lose high value jobs, export opportunities and a key national asset. It is not just Yeovil who stands to suffer from this. Thousands of jobs and substantial high value high-tech industrial production elsewhere in the country is also at jeopardy. Leonardo currently spends more than a third of a billion pounds with suppliers all across the UK, 30% of which is with SMEs. In the south of England alone, the total value of sub-contract business dependent on Yeovil amounts, to £275 million pounds. What I am asking is simple. The Government has a strategy for preserving our sovereign capacity in the production of fast combat jets. It has one to preserve our ability to build warships. What we need now – and urgently – is a clear statement from the Government that it values and will preserve Britain’s sovereign capability to design, engineer and manufacture our future rotary wing aircraft. A key national aero-space industrial asset, providing the best for our armed forces, a work force whose skills have served the defence of the nation for more than 100 years, export opportunities, and tens of thousands of high-tech jobs across the country depend on it. “Sometimes it is silence that speaks loudest. This Industrial Strategy mentions Airbus, Rolls Royce, Boeing, Bombardier Aerospace, GE Aviation ,GKN, Loughborough and Solihull. But it mentions neither helicopters or Yeovil once. Given the worries about preserving the UK’s stand alone ability to manufacture helicopters and the integrity of the Yeovil site I have repeatedly lobbied the Government to use the opportunity of the Industrial Strategy to state clearly the Government’s commitment to maintaining the full capacity to manufacture helicopters on the Yeovil site, the UK’s only stand alone helicopter manufacturing facility and as such a key part of the country’s aerospace industrial base. No such commitment is contained in this strategy paper. To say that this is disappointing would be an understatement. Like many others in the Yeovil community I feel let down and angry about this omission. I am now informed that this is paper is being published for consultation only. But bitter and long experience has taught me what that means. What we have been looking for is not consultation, but influence on the Government by our local MP. It is inconceivable that, under the coalition when David Laws was our MP, a national Industrial Strategy like this would have been published without a clear commitment to preserve the full range of capacities of the Yeovil site. Thank you for your letter of yesterday. I am glad that you have now agreed that the AW159 tools and jigs will not be allowed to leave the Yeovil site for Poland unless and until there is a full in-depth study of the comparative costs of production on the two sites and that this will involve all relevant factors, such as the impact on the overheads of Leonardo’s Yeovil site, the costs both of transporting the tools and jigs to Poland and of transporting the assembled AW159 airframes back from Poland back to Yeovil for fitting out. I am grateful to you for finally giving this undertaking which will, I know be welcomed, not just by the Leonardo workforce, but also by the Yeovil community at large. I also welcome this change of policy in favour of a proper competitive process, rather than repeating the procedure which applied when the Government foolishly gave the recent Apache order to the United States without any kind of tendering process. One simple question. Given how much locally and nationally depends on this decision (not least because of what happened over the Apache order) I am sure you will agree with me that the Government should be as transparent about its forthcoming decision on the tools and jigs as possible. Of course I realise that the details of the relative costs which are incorporated into your decision cannot not be made public as they will be commercially confidential. But I hope you will be able, at the very least, to agree that, when you announce the decision, you will also make public the broad list of the factors which have been taken into account. I would be most grateful if you would provide me with confirmation that you have no difficulty with publishing such a list at the appropriate time. commitment, when the White Paper is finally published, will be treated with shock, even anger, in the Yeovil area and far beyond. “I am grateful to Minister Baldwin for making the journey from London to make this announcement. Of course any and every new order is welcome, especially in the difficult post-Brexit climate. But unfortunately these are not new orders. They are recycled news from the time of the Coalition. As the MoD themselves admit in their Press Release, this announcement merely enacts the detail of the deal negotiated by David Laws in 2012. The issue for the Government is not, will they recycle old jobs as new ones, but will they use the leverage they have through the ownership of Wildcat tooling and jigs to stop Yeovil losing jobs which will otherwise go to Poland in order preserve not just the long term viability of the Yeovil site, but also a key element of the national aerospace industrial base.? Of course the decision of where this work goes must be made commercially. 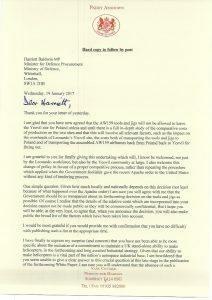 But the Government can and should demand that any Leonardo decision which affects UK jobs is based on a proper in depth study of the comparative costs of manufacturing these Wildcat parts in Yeovil and Poland. I do not understand why they will not insist on this. Thank you for finding time to meet with me yesterday to discuss the situation in Yeovil, following the GKN redundancies. I was glad to hear of your work abroad to sell the AW159 Wildcat helicopter and to know that you believe this aircraft has wide market appeal in other countries. 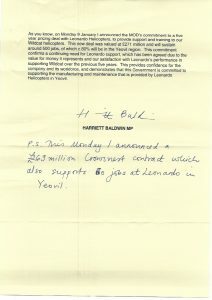 But I am sure you will agree with me that it is vital that the benefit of the work and skill enhancement of these sales, if they are achieved, should benefit, not just Leonardo, but the Yeovil site and its workforce. You know my concerns on this matter, which I repeated to you in detail during our meeting. It seems to me that there is nothing in the Government’s Strategic Partnership Agreement with Leonardo which would in itself prevent Leonardo from effectively siphoning off technology assets and skills from Yeovil to Italy, while transferring Italian costs to the Yeovil site. I am, I should stress, NOT saying this is happening – only that the terms of the agreement as it stands means that it could happen – with very grave consequences for the Yeovil site as a whole. I accept, of course that any such “siphoning” strategy would be contrary to the spirit of the Strategic Agreement. But unhappily it is not, it appears, contrary to its letter. I asked you for an undertaking that the Government would keep a close oversight on the conduct of the Strategic Partnership in order to ensure that the Yeovil site is not disadvantaged. 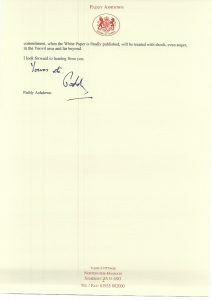 I hope you will be able to provide this in your response to this letter. 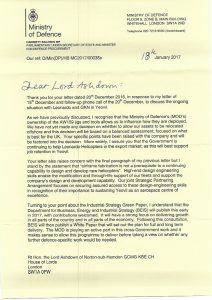 I also pressed you, as I have in my letters to the Secretary of State, for a clear undertaking that the forthcoming Government Green Paper on the national industrial strategy, due to appear you said before the end of the year, would include a clear statement that the Government regards Britain’s stand-alone ability to design, manufacture and assemble helicopters as an essential part of our national aero-space industrial base which should be preserved. I was, I confess, surprised to learn that, even at this late stage you were unable to provide this assurance, on the grounds that the Green Paper is being drafted by the Department for Business, Energy and Industrial Strategy. But surely it cannot be the case that, as Minister for Defence Procurement whose decisions have a profound impact on the country’s aero-space industry, that you have not had – and do not intend to seek – input into the Green Paper? I hope you will be able to re-assure me on this matter. If it were to be the case that there was no such statement in the Green Paper, then people would be bound to conclude that this Government, unlike its predecessors, was not fully committed to maintaining the full range of skills, integrated assembly and technology, which only the Yeovil can provide for the nation. Finally, there is the matter of the GKN tooling for the AW 159 Wildcat work currently being carried out in Yeovil. This tooling is, as you know, essential for the production of the AW159. I pointed out to you the fact that the MoD owns this tooling gives the Government very substantial leverage over what happens next. It is open to the MoD, as owners of this tooling, to insist that it will not be shipped abroad, but maintained on the Yeovil site. This will, of course ensure that much the work involved will stay in Yeovil, rather than being allowed to leach away elsewhere, along with the technology and skills involved, We both agreed that the Government’s intention is to ensure that the Leonardo relationship should enable “the Yeovil group to continue to be a centre for the design and development of the AW159 and other aircraft”. I cannot see how this commitment could be fulfilled if the Government fails to use its ownership of the 159 tooling to ensure that the lost GKN work stays on the Yeovil site, instead of being shipped abroad, along with the jobs involved. I hope that you will be able to give me this undertaking in the near future. Thank you again for your time. I look forward to hearing from you.